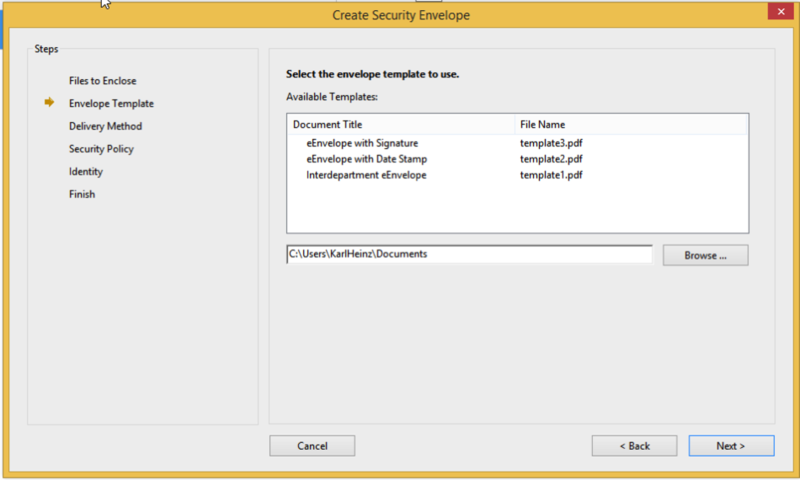 Adobe Acrobat has had an interesting feature since at least Acrobat 8: A “Security Envelope” allows the user to pack any document into such an “envelope” and encrypt the contents. Only the recipient with the correct “key” can decrypt these files. This is not limited to just PDF files, you can add Word, Excel, InDesign, and other files as well. 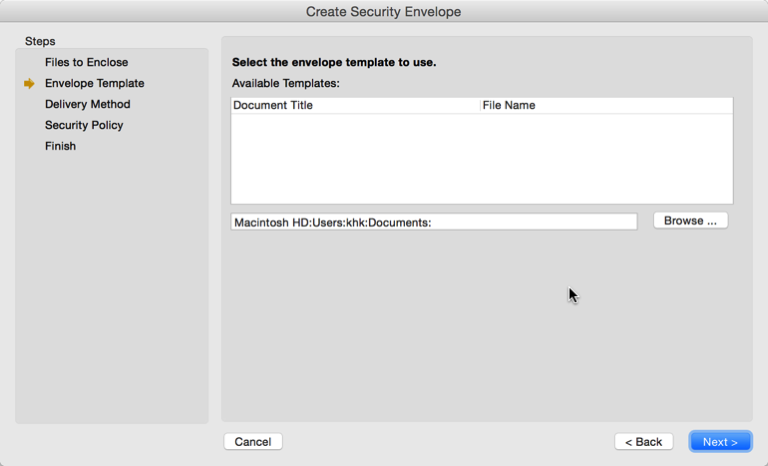 The way this function works is as follows: You first select the files you want to “stuff” into your envelope, then you select what envelope template you want to use, and then you select the security settings you want to apply. This is not a new bug in Acrobat DC, these three default templates have been missing for a long time. All we can do is to browse the filesystem and point this dialog to a security envelope template that’s installed somewhere. 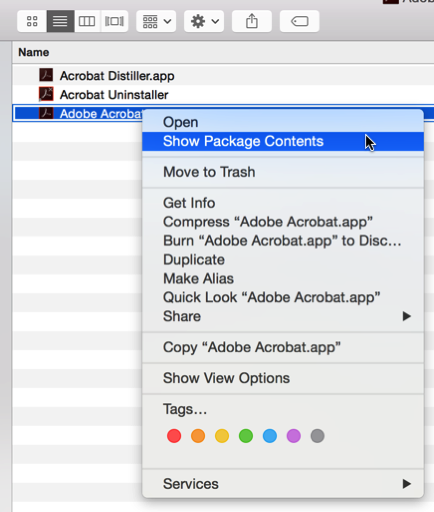 We can click on the “Browse” button and then navigate to this location in Acrobat’s application bundle. Because the files are stored in the application bundle, we need a second Finder window in which we display this folder, and then drag&drop the file we want to use into the “Envelope Templates” open dialog. Or, we can copy these template files to a directory in e.g. the user’s “Documents” folder, then click on the “Browse” button and navigate to that directory. That’s a bit more straight forward, because we only have to navigate into the application bundle once in order to copy the files to our desired target directory. Because option #2 is so much easier to use, the following will discuss how to set up such a copy of the templates folder. Open up a Finder window and navigate to e.g. the “Documents” folder and select to create a new folder (e.g. via File>New Folder). Rename this folder so that it uses a meaningful name (e.g. “Acrobat Security Envelopes”). Now you can navigate to “/Applications/Adobe Acrobat DC/Adobe Acrobat.app/Contents/Resources/en.lproj/DocTemplates” and select the three templates and copy them to your newly created directory. From now on, all you need to do when you want to apply a Security Envelope Template is to click on the “Browse” button and then navigate to e.g. “Documents/Acrobat Security Envelopes”. This entry was posted in Acrobat, PDF, Tutorial and tagged Acrobat Bug, Adobe Acrobat, Security Templates. Bookmark the permalink.